The College of Shari`ah and Islamic Studies, represented by the Deanship for Training and Community Service, held the activity of 'Al-Taj wal Ikleel [Crown and Diadem]' for one week, at Jafali hall (2), starting from Sunday, 19 Jumada Al-Thani, 1440 A.H. More than two hundred students attended the event. The first of its activities was a workshop entitled, 'A Mother to Be Proud of', which was conducted by Ms. Khadijah Abu Al-Rish. It gained great interaction on the part of the attendants of the workshop. Next, the female students at the Department of Shari`ah offered an activity entitled, 'Self-Reckoning'. The first day ended with a workshop entitled, 'The Effect of Muslim Women in Al-Andalus', which was offered by Dr. Eman Al-Usaimi and female postgraduate students. The workshop was attended by a number of academic staff and female students. On the second day, Monday, 20 Jumada Al-Thani, 1440 A.H., a course entitled, 'He Loves Those Who Purify Themselves', was offered by Dr. Ebtisam Al-Ghamdi. She explained Allah's saying, 'And He loves those who purify themselves.' Then she mentioned the actions that lead to gaining Allah's love. Tendering Heart Short Talk 2 was presented by the trainer Afrodita Husky, and Tendering Heart Short Talk 3 was offered by the trainer Hind Al-Sulami. On the third day, Tuesday, 21 Jumada Al-Thani, 1440 A.H., a course entitled, 'Give Every Person His Due Right', was offered by Her Excellency Dr. Su`ad Babqi and Her Excellency Dr. Ibtisam Al-Qarni. Tendering Heart Short Talk 4 entitled, 'The Law of Love', was offered by the trainer Elham Al-Kubaisi. 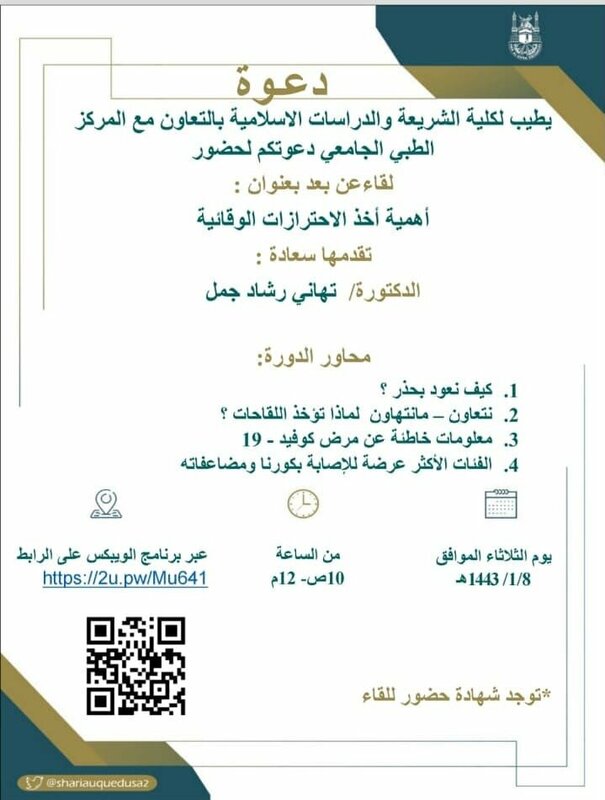 On the last day, Thursday, 23 Jumada Al-Thani, 1440 A.H., a course entitled, “To Find Comfort with Her', was offered by Her Excellency Dr. Laila Al-Muqbil and Her Excellency Dr. Hanan Jistiniyah. Dr. Laila Al-Muqbil began by posing a question about the importance of marital life. Then Dr. Hanan Jistiniyah explained the meaning of “to find comfort with her”. Afterwards, Dr. Laila Al-Muqbil pointed out the rights of the husband, and Dr. Hanan Jistiniyah talked about the rights of the wife. They cited as evidence the life of the Messenger of Allah, and how his life is a good example for marital life. There was an active discussion between the students and trainers, who mentioned some examples of martial life in our community. Next, Tender Heart Short Talk 5 entitled, 'Seek Allah's Support and Never Give Up', was offered by the trainer Urub Al-Tuwaijri. Moreover, Prof. Afnan Al-Tilmisani offered a course entitled, 'Your Footsteps We Follow'. She pointed out that our love for the Messenger of Allah (peace and blessings of Allah be upon him) lies in our following his example and Sunnah in our daily affairs. At the end of every course, the trainer was honored and given a certificate of appreciation for her cooperation and efforts in conducting the course. There was a high turnout for these courses, and a useful interaction among the trainers and attendants, who expressed their admiration and appreciation of the courses. Moreover, the participants expressed the need to repeat this series again. Most attendants were from the female section of the university. Accordingly, the series of "Al-Taj wal Ikleel" was concluded after achieving great success. This was achieved by Allah's favor, and through cooperation among a group of the female academic staff members and distinguished female students.